For the minor league American football team, see Oklahoma Thunder. The team was originally established as the Seattle SuperSonics, an expansion team that joined the NBA for the 1967–68 season. The SuperSonics moved in 2008 after a settlement was reached between the ownership group led by Clay Bennett and lawmakers in Seattle, Washington following a lawsuit. In Seattle, the SuperSonics qualified for the NBA playoffs 22 times, won their division six times, and won the 1979 NBA Championship. In Oklahoma City, the Thunder qualified for their first playoff berth during the 2009–10 season. They won their first division title as the Thunder in the 2010–11 season and their first Western Conference championship as the Thunder in the 2011–12 season, appearing in the NBA Finals for the fourth time in franchise history and first since 1996, when the team was based in Seattle. The Thunder's previous incarnation, the Seattle SuperSonics, were formed in 1967. In their 41 seasons in Seattle, the SuperSonics compiled a 1745–1585 (.524) win–loss record in the regular season and went 107–110 (.493) in the playoffs. The franchise's titles include three Western Conference championships and one NBA title in 1979. In 2006, former Starbucks CEO Howard Schultz sold the SuperSonics and its Women's National Basketball Association (WNBA) sister franchise, the Seattle Storm, for $350 million to the Professional Basketball Club LLC, a group of Oklahoma City investors led by Clay Bennett. The sale of the SuperSonics and Storm was approved by NBA owners the following October. In 2007, Bennett announced that the franchise would move to Oklahoma City as soon as the lease with KeyArena expired. In June 2008, a lawsuit brought by the city of Seattle against Bennett due to his attempts to break the final two years of the Sonics' lease at KeyArena went to federal court. Nearly a month later, the two sides reached a settlement agreement. The terms awarded the city $45 million to get out of the remaining lease at KeyArena, and would have provided an additional $30 million payment to Seattle in 2013 if certain conditions had been met. The owners agreed to leave the SuperSonics name, logo and colors in Seattle for a possible future NBA franchise;[disputed – discuss] however, the items would remain the property of the Oklahoma City team along with other "assets," including championship banners and trophies. [disputed – discuss] On September 3, 2008, the team name, logo, and colors for the Oklahoma City franchise were revealed to the public. The name "Thunder" was chosen in reference to Oklahoma's location in Tornado Alley and Oklahoma City as the home of the U.S. Army's 45th Infantry Division, the Thunderbirds. The Thunder participated in the Orlando Pro Summer League featuring their second-year players, potential free agents and rookies. The players wore generic black and white jerseys reading "OKC-NBA" against an outline of a basketball. The Thunder's temporary practice facility was the Sawyer Center at Southern Nazarene University, which had been used by the New Orleans Hornets when they relocated to Oklahoma City after Hurricane Katrina. The Thunder played several preseason games before the 2008–2009 regular season, but only one of those games was in Oklahoma City. The Thunder made their first appearance in Billings, Montana on October 8, 2008 in an 88–82 preseason loss against the Minnesota Timberwolves. The Thunder played their first Ford Center game on October 14 against the Los Angeles Clippers. In their regular-season home opener, the Thunder faced (and lost to) the Milwaukee Bucks. Earl Watson scored the first points of the season with a layup. Three nights later on November 2, the Thunder won their first game by defeating the Timberwolves, improving their record to 1–3. The team then went on a 10-game losing streak before deciding on November 22 to fire head coach P. J. Carlesimo and assistant Paul Westhead. Assistant coach Scott Brooks then took over on an interim basis. Oklahoma City lost its next four games to tie the franchise losing streak of 14 set in Seattle the previous season. But the team managed to prevent history by winning their next game on the road against the Memphis Grizzlies. As the season continued, the Thunder began to improve. After starting 3–29, the Thunder finished the regular season 20–30 for the remaining fifty games. Not only were they winning more often, they played much more competitively than in the first part of the season. The team brought their record to 23–59 and improved upon their record of 20–62 from the team's final season in Seattle. The late-season successes of the Thunder contributed to the signing of Scott Brooks as the team's official head coach. After moving to Oklahoma City from Seattle, the team's operating situation improved markedly. In December 2008, Forbes magazine estimated the team's franchise value at $300 million – a 12 percent increase from the previous year's $268 million, when the club was located in Seattle. Forbes also noted an increase in percentage of available tickets sold, from 78 percent in the team's last season in Seattle to 100 percent in 2008–09. After an inaugural season filled with many adjustments, the Thunder hoped to improve during their second season in Oklahoma City. Oklahoma City did not make any major moves in the off-season, other than drafting James Harden from Arizona State University with the third overall pick in the NBA Draft. The Thunder selected Rodrigue Beaubois with the 25th pick in the 2009 draft before immediately trading him to the Dallas Mavericks for the 24th pick, center Byron Mullens from Ohio State University. The team then added veteran center Etan Thomas and guard Kevin Ollie. The last major change to their roster occurred on December 22, 2009, when the team traded for Eric Maynor from the Utah Jazz. Maynor immediately supplanted Ollie as the backup point guard. From the outset the young team looked determined and cohesive. The increasing leadership of Kevin Durant, along with the growing experience of the Thunder's younger players, including future MVPs Russell Westbrook and James Harden, were signs of the Thunder's improvement. The 2009–10 season included several victories over the NBA's elite teams, including a 28-point blowout over the Eastern Conference champion Orlando Magic and a 16-point blowout of the reigning NBA champion Los Angeles Lakers. Road victories over the San Antonio Spurs, Utah Jazz, Miami Heat, Boston Celtics and Dallas Mavericks further enhanced their reputation. Though they hovered around .500 for the first half of the season, they went on a 9-game winning streak that sent them into serious playoff contention. Kevin Durant became the youngest player in league history to win the scoring title, averaging 30.1 points per game while playing in all 82 games. The Thunder finished 50–32, more than doubling their win total from the previous season. The 50–32 record tied the 2008 Denver Nuggets for the most wins by an 8th seed in the modern Playoffs era. The Oklahoma City Thunder also had the same record as the Boston Celtics in this season. They finished fourth in the Northwest Division and eighth in the Western Conference playoff standings, and earned a spot in the 2010 NBA Playoffs. On April 22, the team secured their first playoff win in Oklahoma City when they defeated the defending-champion Los Angeles Lakers 101–96. This was also the Thunder's first playoff win at the Ford Center. However, the Thunder tied the series at 2 games each, but the Lakers won the last 2 games in the series to win it 4-2. Oklahoma City ranked twelfth in overall attendance in the NBA, and seventh in percentage of available seats occupied (98 percent, including 28 sellouts in 41 home games). The team's operating situation also continued to improve in 2009–10. Forbes magazine estimated the team's franchise value at $310 million (an increase of $10 million over the prior year) with an estimated operating profit of $12.7 million (the first operating profit in years for the franchise). Financially, the Thunder organization continued to build on the positive returns experienced from relocating from Seattle to Oklahoma City. In January 2011, Forbes magazine estimated the franchise's worth at $329 million, up six percent from 2009–10 and ranking No. 18 in the NBA. The magazine also estimated the franchise's revenue at $118 million and operating profit at $22.6 million – up 6.3 percent and 78 percent, respectively, from the previous year. The Thunder finished the 2010–2011 season with a 55–27 record, a five-win increase from their breakout season the previous year. The team also captured their first division title since moving to Oklahoma City, and seventh in franchise history. In the wake of a fourth-seed versus fifth-seed match-up against the Denver Nuggets, Kevin Durant scored 41 points in Game 1 to set a new career playoff high. In the final game of the series, he again scored 41 and forward Serge Ibaka nearly tied the record for most blocks in a playoff game (10, set by Mark Eaton, Hakeem Olajuwon and Andrew Bynum) with 9 blocks. The Thunder won the series 4 games to 1 and were set to face off against the Memphis Grizzlies who achieved an eight-seed upset over the San Antonio Spurs just days before. The Thunder advanced to the Western Conference Finals with a seven-game series triumph over the Grizzlies. Durant was again the star, scoring 39 points in the clinching Game 7, while Russell Westbrook also had a triple-double. Despite hard-fought battles with the eventual NBA champs, the Thunder fell to the Dallas Mavericks 4–1 in the Western Conference Finals. The Thunder had a chance to tie the series in Game 4, but they were unable to hold a 15-point lead with five minutes remaining in the fourth quarter. They ended up losing in overtime by the score of 112–105. During the extended lockout, Thunder players played in exhibition games and even local pickup games to stay in shape. When the abbreviated training camp began, Oklahoma City started with an intact roster and all players, except for Russell Westbrook. In addition, Kendrick Perkins lost more than 30 pounds during the lockout. The Thunder made their two pre-season appearances, after the lockout, against the Dallas Mavericks, winning both games. They won their first regular-season game against Orlando at home and went on a five-game winning streak. Kevin Durant became the sixth player to score 30 or more points in four consecutive games at the start of a season. In addition, the Thunder was the first to sweep their back-to-back-to-back games, winning a home-and-home series with the Houston Rockets, then routing the San Antonio Spurs. Thunder players Durant, Westbrook, Harden, Perkins, and Ibaka made it onto the 2012 All-Star ballots. After the Thunder's win over the Utah Jazz on February 11, 2012, Scott Brooks was named as the head coach for the Western Conference All-Star squad for the 2012 NBA All-Star Game in Orlando, Florida. In the 2012 NBA Playoffs, the Thunder swept the defending champion Dallas Mavericks in the first round to advance and face off against their first round foes from 2010, the Los Angeles Lakers. They defeated the Lakers in five games and advanced to play the San Antonio Spurs in the Western Conference Finals. The Thunder lost the first two games against the Spurs but won the next three including a Game 5 road win, to take a commanding 3–2 game lead in the series. In Game 6, the Thunder defeated the Spurs 107–99 and advanced to the 2012 NBA Finals. Durant led the way with 34 points, playing all of regulation time in the game. In the 2012 NBA Finals against the Miami Heat, the Thunder won the first game at home but then lost four in a row and lost the series in five games. In the 2012 NBA draft, the Thunder selected Baylor University forward Perry Jones III with the 28th overall pick. The Thunder also signed free agents Hasheem Thabeet and Daniel Orton, and signed guards Andy Rautins and DeAndre Liggins. They re-signed forward Serge Ibaka to a four-year, $48 million extension. After failing to sign James Harden to an extension that was reportedly worth four years and $52 million, the team decided to trade Harden rather than having to pay the luxury tax penalty. On October 27, 2012, the Thunder traded Harden along with center Cole Aldrich and forwards Daequan Cook and Lazar Hayward to the Houston Rockets for Kevin Martin, Jeremy Lamb, first round draft picks from Toronto and Dallas, and one second round draft pick. Martin took over Harden's sixth-man role for the season. The Thunder finished with a 60–22 regular season, taking both the Northwest division title and top seed of the Western Conference. In the first round of the playoffs, they faced the 8th-seeded Houston Rockets, featuring former team member James Harden. In game 2 of the series, Russell Westbrook was struck by Rockets point guard Patrick Beverley, and fell down with an injury and missed the rest of the playoffs after having knee surgery. Without the team's second-leading scorer, the Thunder, who had a 3–0 lead, lost the next two games to bring the series to 3–2. In game 6, the Thunder defeated the Rockets to advance to the second round, facing a rematch of the 2011 second round, with the Memphis Grizzlies. The Thunder lost the series 4–1, losing four straight games after winning Game 1 at home. In the 2013 NBA draft, the Thunder selected 12th pick Steven Adams, traded for the 26th pick Andre Roberson, and selected 47th pick Grant Jerrett. Kevin Martin was not re-signed, and he opted to join the Timberwolves, while the team were only able add free agent Ryan Gomes, and re-sign Derek Fisher, to conclude their off-season movements. The team finished second in the Western conference with a 59–23 record. They met the Memphis Grizzlies for the third time in the playoffs, which set a record for most consecutive overtimes in a playoff series, with four. Oklahoma City prevailed in seven games to play the Los Angeles Clippers in the semi-finals, whom they defeated in six games. Their final playoff opponent, in the Western Conference Finals, was the San Antonio Spurs, with the Spurs winning, 4–2. With the 21st and 29th picks in the 2014 NBA draft, the Thunder selected Mitch McGary from Michigan and Josh Huestis from Stanford. "He brings energy, passion, and great basketball IQ and toughness what we value" said Presti on drafting McGary. [This quote needs a citation] Oklahoma City also signed Semaj Christon in the draft. [clarification needed] On July 3, the Thunder signed Sebastian Telfair. But they lost shooting guard Thabo Sefolosha as his contract expired and he agreed to a three-year, $12 million contract with the Atlanta Hawks. Several weeks before the season started, the Thunder suffered a setback as Durant was diagnosed with a Jones fracture in his right foot and missed the first 17 games of the season. During the opening game against the Portland Trail Blazers, Westbrook scored 38 points, but found himself sidelined due to a small fracture in his right hand. He missed 16 games, during which Oklahoma City went 4–12. During the middle of the season Westbrook and Durant both came back, and similarly suffered more injuries. Durant was ruled out of the rest of the season in March, deciding to have foot surgery. Westbrook also had to undergo surgery in early March, to repair a fracture in the zygomatic arch bone of his right cheek. Several days later he returned and recorded several triple-doubles on his way to Western Conference Player of the Month honors from February to April. He also won the 2014–2015 NBA scoring title. However, despite the effort, the Thunder missed the playoffs due to a tiebreaker with the New Orleans Pelicans, and Westbrook fell short of the MVP award, finishing fourth in voting. They finished with a 45–37 record. On April 22, 2015, Scott Brooks was fired as the Thunder head coach. Billy Donovan was hired on April 30, 2015. This was Donovan's first major NBA coaching job, after he initially accepted and then left the Orlando Magic job in 2007. With the 14th and the 48th picks in the 2015 NBA draft, the Thunder selected Cameron Payne from Murray State and Dakari Johnson from Kentucky. With Billy Donovan as the team's head coach the Thunder won the Northwest Division and clinched the third seed in the Western Conference. The team reached the Western Conference Finals for the fourth time in a span of six seasons, but was eliminated by the Golden State Warriors in seven games, after being up 3–1. After the season Kevin Durant left the team in free agency for the Warriors. The move was not well received by the public or NBA analysts, with many comparing the move to LeBron James' 2010 off-season departure from Cleveland to join the Miami Heat. On July 7, he was officially introduced by the Warriors organization and signed a two-year, $54.3 million contract, with a player option after the first year. On August 4, 2016, Westbrook agreed to a 3-year extension to remain with the Thunder. With an average of 31.6 points, 10.4 assists, and 10.7 rebounds, Westbrook became the first player since Oscar Robertson to average a triple double for an entire NBA regular season, and only the second in NBA history (the other being Robertson). On April 2, 2017, Westbrook tied Oscar Robertson's record for most triple doubles in an NBA season (41); he broke the record on April 9 against the Denver Nuggets, marking his 42nd triple double of the season. Westbrook, in that game, also hit the game winning buzzer beater from 36 feet, ending the Nuggets' playoffs hopes and securing the Thunder's 3rd seed matchup with the Houston Rockets in the NBA playoffs. Oklahoma City lost the playoff series in the first round to the Houston Rockets 4–1. Despite the team's loss, Westbrook averaged a +14 while on the court and a triple double during the series and was named league MVP after the season. In the 2017 NBA draft, the Thunder selected guard Terrance Ferguson with the 21st pick, and signed him to a four year rookie-scale contract. To further bolster the roster and improve Westbrook's supporting cast, the Thunder's front office made a series of aggressive moves to reshape the team. On July 6, 2017, the Thunder acquired four-time All-Star forward Paul George in a trade with the Indiana Pacers in exchange for guard Victor Oladipo and forward Domantas Sabonis. The team then signed veteran point guard Raymond Felton and sharp-shooting power forward Patrick Patterson in free agency on July 10. Finally, on September 25, the Thunder acquired ten-time All-Star forward Carmelo Anthony from the New York Knicks in exchange for center Enes Kanter, forward Doug McDermott, and a 2018 second round draft pick they had previously acquired from the Chicago Bulls in the Cameron Payne trade. On September 29, 2017, the Thunder signed Russell Westbrook to a 5 year extension. The Thunder finished the 2017–18 season with a 48–34 record and lost to the Utah Jazz 4–2 in the first round of the playoffs. In the 2018 NBA draft, the Thunder selected guard Devon Hall with the 53rd pick and forward Kevin Hervey with the 57th pick. Devon Hall did not sign with the Thunder, instead signing with the Cairns Taipans of the Australian National Basketball League. Kevin Hervey signed with the Thunder's NBA G-League affiliate, Oklahoma City Blue. Additionally, the Thunder traded a 2019 second-round pick to acquire Hamidou Diallo, who had been selected by the Brooklyn Nets with the 45th pick. Diallo signed a 3 year contract with the Thunder. On July 6, 2018, Paul George re-signed with the Thunder. In July 2018, the Thunder traded forward Carmelo Anthony and a 2022 protected first round pick to the Atlanta Hawks in a three way trade. In the trade, the Thunder acquired guard Dennis Schroder from the Atlanta Hawks and forward Timothe Luwawu-Cabarrot from the Philadelphia 76ers. The Thunder also acquired guard Deonte Burton, signing him to a two-way contract with the Oklahoma City Blue. Additionally, the Thunder acquired center Nerlens Noel in free agency, and traded for Abdel Nader from the Boston Celtics. On July 20, 2018, the Thunder traded away Dakari Johnson for Orlando's Rodney Purvis (who was later traded to the Boston Celtics with Oklahoma City getting cash considerations for the deal). Note: All arenas used before 2008 were used by the defunct Seattle SuperSonics franchise. Seattle arenas had hosted two NBA All-Star Games; the 1974 game in Seattle Center Coliseum and the 1987 game in the Kingdome, where SuperSonics forward Tom Chambers grabbed MVP honors. Opened in June 8, 2002 as the Ford Center, Chesapeake Energy Arena was built without luxury accommodations, but designed to accommodate luxury "buildouts" should a professional sports franchise make the Chesapeake Energy Arena their home arena. It was finished at a cost of $89.2 million. A plan for such build-out improvements began in 2007. It came in the wake of the acquisition of the Seattle SuperSonics by an Oklahoma City-based ownership group the previous October. A city ballot initiative approved by a 62 percent margin on March 4, 2008, extended a prior one-cent city sales tax for a period of 15 months in order to fund $101 million in budgeted improvements to the arena and a separate $20 million practice facility for a relocated franchise. Renovation work on the arena was delayed by a sales tax-receipts shortfall during the 2008–10 economic crisis. Revised plans limited the size of a new glass entryway and eliminated a practice court to accommodate the shortfall. Major construction work on the arena expansion was also delayed from the summer of 2010 to the summer of 2011. Seating capacity of the stadium is 18,203 for professional NBA basketball games. Similar revisions were made to the plans for the Thunder's separate practice facility, for a total cost savings of approximately $14 million. The Thunder's practice facility completion date was pushed back to approximately March 2011. Note: All mascots used before 2008 were used by the defunct Seattle SuperSonics franchise. On February 17, 2009, Rumble the Bison was introduced as the new Oklahoma City Thunder mascot during halftime of a game against the New Orleans Hornets. Rumble was the winner of the 2008–2009 NBA Mascot of the Year. Simmons speculated that the Oklahoma City bombing played a major part in the team's culture, noting that Thunder general manager Sam Presti has every new Thunder player visit the Oklahoma City National Memorial, and encourages players to look into the stands and consider that many of the team's fans were personally affected by the event. He also noted, however, that the fact that the Thunder is the only team from Oklahoma City (or indeed the state of Oklahoma) in one of the nation's four major leagues contributes mightily to the city's devotion. Thunder fans are also reportedly much more likely to attend major home games than most other NBA fanbases. According to a source in the ticket industry, only five percent of tickets to the 2012 NBA conference finals listed for sale on secondary market sites such as StubHub were for Thunder home games, and for every ticket listed for a Thunder home game in the 2012 NBA Finals, 10 tickets for Heat home games were listed. The team and its fanbase regularly use the slogan "Thunder Up!" which was prominently displayed on T-shirts during the 2012 playoffs. The Thunder hold the draft rights to the following unsigned draft picks who have been playing outside the NBA. A drafted player, either an international draftee or a college draftee who is not signed by the team that drafted him, is allowed to sign with any non-NBA teams. In this case, the team retains the player's draft rights in the NBA until one year after the player's contract with the non-NBA team ends. This list includes draft rights that were acquired from trades with other teams. For details on Seattle SuperSonics history, see Seattle SuperSonics records. For the complete list of Seattle SuperSonics players see: Seattle SuperSonics all-time roster. The Thunder have retired one number. As the Thunder's original iteration, the Seattle SuperSonics had retired six numbers. In addition, the SuperSonics awarded an honorary microphone to longtime broadcaster Bob Blackburn, who had called the majority of the team's games from 1967 through 1992. 1 Served as head coach (2000–2005). 2 Served as head coach (1969–1972; 1977–1985). The Oklahoma City Thunder unveiled their first logo on September 3, 2008. According to majority owner Clay Bennett, the team's logo takes several of its elements from other Oklahoma sports teams, such as the Oklahoma Sooners and Oklahoma State Cowboys and Cowgirls. The uniform design was unveiled on September 29, 2008. An alternate uniform was unveiled on November 8, 2012, featuring only navy blue and white colors. Unlike their regular uniforms, the wordmarks on the alternate are written vertically. A second alternate uniform was unveiled on March 1, 2015. A white uniform with sleeves, it features the Thunder partial logo in the center of the chest, and the shorts showcase bolts in light blue and sunset colors. A third alternate uniform was unveiled on September 25, 2015. A sunset-colored uniform, it features the Oklahoma City abbreviation "OKC" in navy block letters trimmed in white. On the back of the jersey, player names sit below the numbers. The shorts display a sunset base with navy panels down the side showcasing the Thunder partial logo on each leg. The Thunder wore the sunset alternates for 18 games in the 2015-2016 season, including all 13 of its Sunday games. Moving to Nike in 2017, the Thunder kept their existing white ("Association") and blue ("Icon") uniforms almost intact with the exception of the "OKC" abbreviation on the beltline and truncated shoulder stripes. The team also released a new alternate "Statement" uniform with an italicized "OKC" lettering in sunset orange and a navy base with blue gradients that evoke sound waves generated from the team's fanbase. The Thunder also collaborated with Nike to produce annual "City" edition uniforms that intend to pay tribute to local cultures or team traditions. The 2017–18 "City" uniform featured a grey base with sunset orange and blue lines that were inspired by the Thunder's uptempo style. For 2018–19, the Thunder's "City" uniform featured a turquoise base and bold white lettering with navy and sunset orange trim; the uniform was inspired by Oklahoma's Native American heritage. Nike also released an "Earned" uniform starting with the 2018–19 season and were only given to the 16 teams who qualified in the 2018 NBA Playoffs. The Thunder's "Earned" uniform was a basic palette swap of the team's "Statement" uniforms, featuring a sunset orange base and navy letters. All Thunder games are broadcast on the Thunder Radio Network, fronted by flagship stations WWLS-FM 98.1 and KWPN AM 640 in Oklahoma City. Matt Pinto is the radio voice of the Thunder. For their first two seasons, the Thunder's TV broadcasts were split between Fox Sports Oklahoma (a regional fork of Fox Sports Southwest), which broadcast most of the games, and independent station KSBI (channel 52), with around 65 Thunder games airing during the season and more than half of the games available in HD on Fox Sports Oklahoma, along with other team-related programming such as pre-game shows. Around 15 to 20 regular-season games were broadcast over the air on KSBI, which had a network of re-broadcasters spanning the entire state. All televised games are called by Brian Davis on play-by-play and Michael Cage as color commentator. During the 2009–10 season, KSBI telecast all Thunder games it aired in high definition (KSBI had previously aired in HD the first regular-season game played at the Ford Center – against the Milwaukee Bucks on October 29, 2008 – while all other games during the 2008–09 season were telecast on KSBI in standard definition). 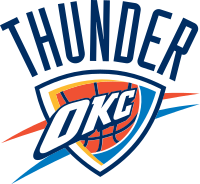 On August 3, 2010, the Thunder signed a new exclusive multi-year agreement with Fox Sports Oklahoma, beginning with the 2010–11 season, ending the team's broadcasts on KSBI. On October 22, 2012, the Thunder announced that Lesley McCaslin would be the new Thunder sideline reporter. On July 21, 2014, the Thunder announced that Long would not return to be its TV color commentator on Fox Sports Oklahoma. On September 17, 2014, the Oklahoma City Thunder announced that 15-year NBA veteran Michael Cage would be the new color analyst, joining Brian Davis on television and Matt Pinto on the radio when the game is not on Fox Sports Oklahoma. Davis was replaced as the television play-by-play announcer by Chris Fisher prior to the 2018–19 season. ^ "History: Team by Team" (PDF). 2018-19 Official NBA Guide. NBA Properties, Inc. October 8, 2018. Retrieved January 29, 2019. ^ "NBA.com/Stats–Oklahoma City Thunder seasons". Stats.NBA.com. NBA Media Ventures, LLC. October 17, 2015. Retrieved October 17, 2015. ^ "General Information" (PDF). 2018–19 Oklahoma City Thunder Media Guide. NBA Properties, Inc. November 5, 2018. Retrieved December 2, 2018. ^ "Oklahoma City Thunder Reproduction and Usage Guideline Sheet". NBA Properties, Inc. Retrieved December 22, 2017. ^ Crall, Joseph (March 15, 2019). "The Heart of OKC: Thunder, Love's Expand Partnership to Include Prominent Placement on Thunder Jersey". OKCThunder.com (Press release). NBA Media Ventures, LLC. Retrieved March 15, 2019. ^ "The Professional Basketball Club, LLC". OKCThunder.com. NBA Media Ventures, LLC. Retrieved April 22, 2017. ^ Mayberry, Darnell (April 21, 2008). "Sonics will stay in division". The Oklahoman. Retrieved July 3, 2008. ^ Garcia, Art (November 19, 2008). "Western Conference Insider: Realigning the West". NBA.com. NBA Media Ventures, LLC. Retrieved April 29, 2015. ^ "City Preparing Ford Center For NBA Team". KOCO-TV. July 3, 2008. Archived from the original on July 19, 2011. Retrieved July 4, 2008. ^ "Oklahoma City Franchise To Purchase Tulsa 66ers Of NBA D-League" (Press release). NBA Media Ventures, LLC. July 31, 2008. Archived from the original on August 5, 2008. Retrieved July 28, 2015. ^ Mayberry, Darnell (August 1, 2008). "OKC's NBA franchise buys Tulsa's D-League team". The Oklahoman. Retrieved August 1, 2008. ^ "The Thunder Hits Oklahoma City Wednesday". OKCThunder.com. NBA Media Ventures, LLC. October 27, 2008. Retrieved September 26, 2015. ^ "Basketball Club of Seattle Announces Sale of Sonics & Storm". SuperSonics.com. NBA Media Ventures, LLC. July 18, 2006. Archived from the original on July 19, 2006. Retrieved May 7, 2016. ^ "NBA approves sale of Sonics, Storm". ESPN. Associated Press. October 24, 2006. Retrieved July 2, 2008. ^ Johns, Greg (November 2, 2007). "Bennett says Sonics going to Oklahoma". Seattle Post-Intelligencer. Retrieved April 2, 2008. ^ "SuperSonics, Seattle reach last-minute settlement". ESPN. July 2, 2008. Retrieved July 2, 2008. ^ Allen, Percy (July 6, 2008). "Seattle and Oklahoma City will share the Sonics' franchise history". The Seattle Times. Retrieved April 9, 2019. ^ a b "Oklahoma City will be named Thunder, wear blue, orange, yellow". ESPN. September 4, 2008. Retrieved September 4, 2008. ^ "Thunder Rolls Into Oklahoma City". OKCThunder.com (Press release). NBA Media Ventures, LLC. September 3, 2008. Retrieved April 21, 2018. ^ "Sawyer Center". Southern Nazarene Crimson Storm. December 1, 2010. Retrieved December 1, 2010. ^ Mayberry, Darnell (August 13, 2008). "Oklahoma City NBA team to face hectic pace in preseason". The Oklahoman. Retrieved August 13, 2008. ^ Sheridan, Chris (November 22, 2008). "Carlesimo fired; Brooks to take over Thunder in interim". ESPN. Retrieved November 22, 2008. ^ "Thunder snap 14-game losing streak behind Durant's 30". USA Today. Associated Press. November 22, 2008. Retrieved November 22, 2008. ^ "NBA Team Valuations". Forbes. December 3, 2008. Retrieved May 12, 2010. ^ "Oklahoma City Thunder". Forbes. December 3, 2008. Retrieved May 12, 2010. ^ Pimentel, Roger. "NBA Playoffs in Numbers: Eight Statistics You Weren't Expecting". How To Watch Sports. Archived from the original on July 8, 2012. Retrieved March 22, 2011. ^ "2009–2010 NBA Attendance". ESPN. Retrieved April 30, 2010. ^ a b "NBA Team Valuations". Forbes. Forbes.com Mobile. December 9, 2009. Retrieved May 12, 2010. ^ a b "#18 Oklahoma City Thunder". Forbes. Forbes.com Mobile. January 27, 2011. Retrieved January 27, 2011. ^ Mayberry, Darnell (April 6, 2011). "Thunder beats Clippers to wrap up Northwest Division title". The Oklahoman. Retrieved April 7, 2011. ^ Young, Royce (April 28, 2011). "Durant's epic performance in Game 5 is what legends are made of". CBS Sports. Retrieved October 15, 2012. ^ Torres, Adry (August 2, 2011). "Kevin Durant scores 66 at Rucker Park". ESPNNewYork.com. Retrieved March 27, 2014. ^ McMenamin, Dave (October 10, 2011). "Lockout added water to grass roots". ESPNLosAngeles.com. Retrieved March 27, 2014. ^ "Kevin Durant, Washington win city battle". ESPN. August 21, 2011. Retrieved September 6, 2011. ^ Weidie, Kyle (August 21, 2011). "Drew-Goodman game lives up to hype". ESPNLosAngeles.com. Retrieved March 27, 2014. ^ "Thunder Names Billy Donovan Head Coach". OKCThunder.com (Press release). NBA Media Ventures, LLC. April 30, 2015. Retrieved May 14, 2015. ^ Young, Royce (May 1, 2015). "Thunder hire Billy Donovan as coach". ESPN.com. Retrieved May 14, 2015. ^ Leonard, Pat (July 7, 2016). "Kevin Durant's move to leave Thunder for Warriors is worse than LeBron James' 'Decision': That's Debatable". nydailynews.com. Retrieved July 7, 2016. ^ "Warriors Sign Free Agent Forward Kevin Durant". Warriors.com. NBA Media Ventures, LLC. July 7, 2016. Retrieved July 7, 2016. ^ McCauley, Janie (July 7, 2016). "Splash! Kevin Durant finalizes two-year deal with Warriors". Yahoo.com. Retrieved July 7, 2016. ^ Charania, Shams (July 27, 2017). "Shams Charania on Twitter". Twitter. Retrieved October 28, 2018. ^ "Thunder Acquires All-Star Forward Paul George". OKCThunder.com. NBA Media Ventures, LLC. July 6, 2017. Retrieved July 6, 2017. ^ "Thunder Signs Raymond Felton". OKCThunder.com. NBA Media Ventures, LLC. July 10, 2017. Retrieved July 10, 2017. ^ "Thunder Signs Patrick Patterson". OKCThunder.com. NBA Media Ventures, LLC. July 10, 2017. Retrieved April 21, 2018. ^ "Thunder Acquires All-Star Forward Carmelo Anthony". OKCThunder.com. NBA Media Ventures, LLC. September 25, 2017. Retrieved September 25, 2017. ^ "Bulls acquire Payne, Morrow, and Lauvergne from Thunder". Bulls.com. NBA Media Ventures, LLC. February 23, 2017. Retrieved February 23, 2017. ^ Brunt, Cliff (September 27, 2017). "Russell Westbrook decides he is all-in with Oklahoma City Thunder, signs five-year extension". NBA.com. NBA Media Ventures, LLC. Associated Press. Retrieved October 28, 2018. ^ "Thunder Selects Devon Hall and Kevin Hervey in 2018 NBA Draft". OKCThunder.com. NBA Media Ventures, LLC. June 21, 2018. Retrieved October 28, 2018. ^ Horne, Erik (August 11, 2018). "Thunder second-rounder Devon Hall signs with Australia's National Basketball League". The Oklahoman. Retrieved October 28, 2018. ^ Afseth, Grant (October 5, 2018). "Thunder draft pick Kevin Hervey will play this season for the OKC Blue". USA Today. Gannett Company. Retrieved October 28, 2018. ^ "Thunder Acquires Hamidou Diallo". OKCThunder.com. NBA Media Ventures, LLC. July 6, 2018. Retrieved October 28, 2018. ^ Dang, Kenny (July 26, 2018). "Thunder signed rookie Hamidou Diallo to a 3 year/$4M deal". WelcomeToLoudCity.com. SB Nation. Retrieved October 28, 2018. ^ "Thunder Signs Paul George to Multi-Year Contract". OKCThunder.com. NBA Media Ventures, LLC. July 6, 2018. Retrieved August 31, 2018. ^ Wojnarowski, Adrian (July 20, 2018). "Sources: Melo headed to Hawks, will be waived". ESPN.com. ESPN Internet Ventures, LLC. Retrieved October 28, 2018. ^ Keith Smith [@KeithSmithNBA] (July 7, 2018). "The Oklahoma City Thunder have signed guard Deonte Burton to a two-way contract" (Tweet) – via Twitter. ^ Wells, Adam (July 3, 2018). "Nerlens Noel Reportedly Agrees to Contract with Thunder in Free Agency". Bleacher Report. Retrieved October 28, 2018. ^ "NBA notebook: OKC gets forward Abdel Nader from Celtics for guard Rodney Purvis". The Oklahoman. July 23, 2018. Retrieved October 28, 2018. ^ a b c d e "Individual Records" (PDF). 2015–16 Oklahoma City Thunder Media Guide. NBA Properties, Inc. October 26, 2015. Retrieved May 7, 2016. ^ Arena, Chesapeake Energy. "Overview | Chesapeake Energy Arena". www.chesapeakearena.com. Retrieved December 23, 2018. ^ Knapp, Adam. "Ford Center Arena Improvement Plan". About.com. Retrieved November 17, 2010. ^ "MAPS 3 Citizens Advisory Board Presentation" (PDF). City of Oklahoma City. August 24, 2010. Archived from the original (PDF) on April 11, 2016. ^ Rohde, John (August 8, 2010). "Ford Center practice gym eliminated from renovations". The Oklahoman. Retrieved November 17, 2010. ^ "Oklahoma City might save as much as $14 million on Ford Center renovations, practice facility". The Oklahoman. July 7, 2010. Retrieved November 17, 2010. ^ Rohde, John (November 16, 2010). "Thunder practice facility set for March completion". The Oklahoman. Retrieved November 17, 2010. ^ "Rumble the Bison Debuts as Thunder Mascot". OKCThunder.com. NBA Media Ventures, LLC. February 17, 2009. Retrieved May 27, 2016. ^ "Rumble the Bison Named NBA Mascot of the Year". OKCThunder.com (Press release). NBA Media Ventures, LLC. August 13, 2009. Retrieved August 26, 2009. ^ a b c Simmons, Bill (June 13, 2012). "Thunder Family Values". Grantland.com. Retrieved June 4, 2013. ^ "Taipans Sign Thunder Draft Pick". NBL.com.au. August 12, 2018. Retrieved August 12, 2018. ^ "Oklahoma City Blue Announces Training Camp Roster". OklahomaCity.GLeague.NBA.com. NBA Media Ventures, LLC. October 23, 2018. Retrieved October 23, 2018. ^ "Thunder Acquires Schortsanitis and Trade Exception". OKCThunder.com. NBA Media Ventures, LLC. July 15, 2014. Retrieved February 4, 2014. ^ "Thunder Acquires Trade Exception". OKCThunder.com. NBA Media Ventures, LLC. July 11, 2013. Retrieved April 21, 2014. ^ "Hanging From the Rafters". NBA Media Ventures, LLC. August 9, 2015. Retrieved August 9, 2015. ^ Raley, Dan (February 14, 2006). "Where Are They Now? Blackburn gave Sonics a voice". Seattle Post-Intelligencer. Retrieved August 9, 2015. ^ "Defining Moments: 10 Years of Thunder Basketball". OKCThunder.com. NBA Media Ventures, LLC. July 2, 2018. Retrieved December 20, 2018. ^ Baldwin, Mike (September 4, 2008). "Sky blue will be the color". The Oklahoman. Retrieved May 20, 2016. ^ "Thunder Jerseys Available for Presale". OKCThunder.com (Press release). NBA Media Ventures, LLC. September 30, 2008. Archived from the original on December 2, 2009. Retrieved May 20, 2016. ^ Baldwin, Mike (September 30, 2008). "The uniform: Thunder players turn models". The Oklahoman. Retrieved May 20, 2016. ^ "Thunder 'flashes' new uniforms". KWTV-DT. September 22, 2008. Retrieved October 2, 2008. ^ Dwyer, Kelly (November 9, 2012). "The Oklahoma City Thunder unveil alternate uniforms, to mild local acclaim". Yahoo! Sports. Retrieved November 10, 2012. ^ "Thunder Alternate Uniform, November 9, 2012". OKCThunder.com. NBA Media Ventures, LLC. November 9, 2012. Retrieved November 9, 2012. ^ "New Thunder Uniform Reflects Hometown Spirit". OKCThunder.com (Press release). NBA Media Ventures, LLC. March 1, 2015. Retrieved March 1, 2015. ^ "Thunder Unveils New Alternate Uniform for 2015-16". OKCThunder.com (Press release). NBA Media Ventures, LLC. September 25, 2015. Retrieved September 26, 2015. ^ "New Technology Helps Nike Build Thunder Uniforms". OKCThunder.com (Press release). NBA Media Ventures, LLC. July 27, 2017. Retrieved December 26, 2018. ^ "New Thunder Alternate Uniform Makes a Statement". OKCThunder.com (Press release). NBA Media Ventures, LLC. September 15, 2017. Retrieved December 26, 2018. ^ "Nike NBA City Edition Uniform". Nike.com (Press release). Nike, Inc. December 27, 2017. Retrieved December 26, 2018. ^ "Thunder Unveils New Turquoise Uniform Honoring Oklahoma's Native American Heritage". OKCThunder.com (Press release). NBA Media Ventures, LLC. November 1, 2018. Retrieved December 26, 2018. ^ "Teams unveil Earned Edition uniforms for 2018-19 season". NBA.com (Press release). NBA Media Ventures, LLC. December 12, 2018. Retrieved December 26, 2018. ^ "Thunder Radio Network". OKCThunder.com. NBA Media Ventures, LLC. March 7, 2015. Retrieved March 7, 2015. ^ Bracht, Mel (September 29, 2008). "FS Oklahoma to air Thunder games". The Oklahoman. Retrieved September 29, 2008. ^ Bracht, Mel (October 3, 2008). "KSBI to air Thunder games". The Oklahoman. Retrieved December 20, 2018. ^ "Thunder Signs Exclusive Television Agreement with FOX Sports Southwest". OKCThunder.com. NBA Media Ventures, LLC. August 3, 2010. Retrieved January 25, 2015. ^ Bracht, Mel (October 22, 2012). "OKC Thunder: Lesley McCaslin named team's courtside reporter". The Oklahoman. Retrieved October 27, 2012. ^ Mayberry, Darnell (July 21, 2014). "Oklahoma City Thunder TV analyst Grant Long resigns from position". The Oklahoman. Retrieved January 25, 2015. ^ "Michael Cage to Join Thunder Broadcast Team". OKCThunder.com. NBA Media Ventures, LLC. September 17, 2014. Retrieved January 25, 2015. ^ "Chris Fisher Joins Thunder Broadcast Team on Fox Sports Oklahoma". OKCThunder.com. NBA Media Ventures, LLC. September 24, 2018. Retrieved December 26, 2018. Wikimedia Commons has media related to Oklahoma City Thunder.